A few weeks ago a friend sent me a link to an article published in The Chronicle of Higher Education. 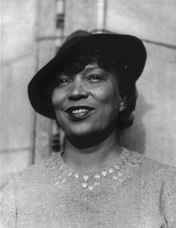 The title was “The Newly Complicated Zora Neale Hurston” authored by two professors Glenda R. Carpio and Werner Sollors of Harvard University. My first thought was what makes Zora complicated? Zora doesn’t start with a swash-buckling “Z” for nothing. That’s why this month Eatonville Restaurant‘s Food & Folklore is pulling back on the fried chicken and pulling out the Oysters Rockefeller for a “Zora in the City” themed event hosted by Zora’s niece Lucy Anne Hurston. This is an opportunity to ask a member of the family just how “complicated” Zora really was in the urban setting. Did Zora have a shoe fetish? Why were her parties the place to be? Did her Shrimp and Okra have anything to do with it? Or Zora’s homemade gingerbread? Surf-n-Turf will be the main entree for the Eatonville event. 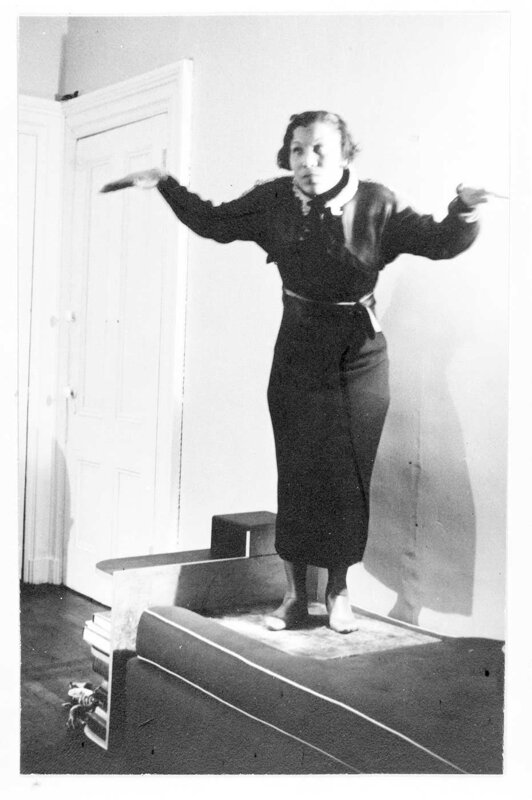 Though Zora’s DC residency coincided with her studies at Howard University, she did do a bit a waitressing at the exclusive Cosmos Club. But you don’t have to be a member to be with Zora in the City. 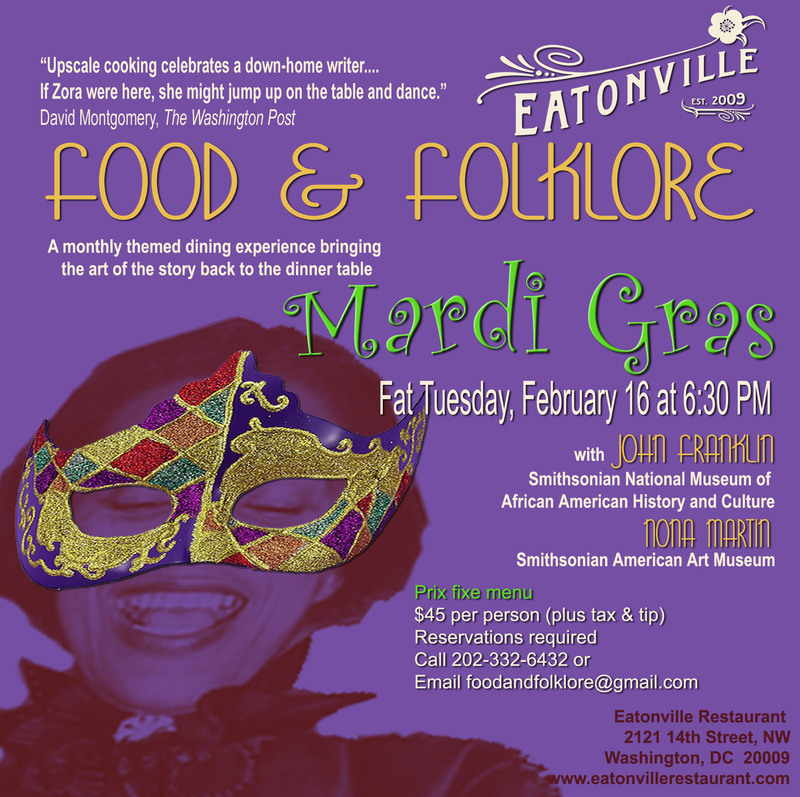 Food & Folklore is the grand finale to Eatonville’s Zora-Fest, the month-long birthday celebration of “everything Zora.” Check their website for other food/drink events and specials. In Freetown, fried chicken was a very special dish. 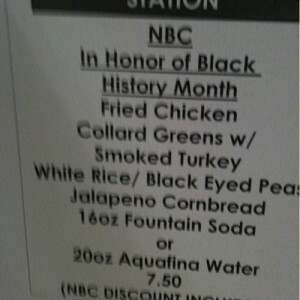 This week’s Black History month moment appears to be the flap over the menu in NBC’s cafeteria at the Rock in New York City. Questlove, a member of The Roots (Jimmy Fallon’s house band), took a pic of the menu and posted it on his Twitter feed. Apparently, Questlove took offense with the menu prepared by another NBC employee, Leslie Calhoun, whom, like Questlove, is black and works as a chef in the kitchen. I may have said this before on this blog. “Talking about somebody’s food is like talking about their mamma.” I wouldn’t call this black-on-black crime, but I definitely can say the dividing line between north and south still stands out in the African American community when it comes to culture especially food. And we thought it was the east coast/west coast thing. That’s called rivalry. This one seems to have its roots in shame. Even in the film Precious, which garnered 6 Oscar nominations including Best Picture, we see the main character stealing a bucket of chicken and binge eating it before throwing it up in a trash can. Is she purging the shame of the fried chicken; or does eating fried chicken lead to criminal and erratic behavior? Precious’ story (based on the novel Push by Sapphire) takes place in 1980s Harlem, one of the stops of the Great Migration of African Americans in the early 20th century from the rural or small town segregated south to the industrial north. Surely there were chicken boxes in their laps to make the journey. Even coming back home, you had that chicken box in your lap because few restaurants welcomed black customers in those days. I’m sure the southern migrants had no clue their fried chicken eating would lead to criminal behavior among their descendants. I guess the glasses of wine Precious’ tutor enjoys in the evening wouldn’t lead anyone on the road to ruin as fried chicken would. There’s more I could say about this film’s class and north/south issues just on the handling of the food alone. Both Questlove and “Precious” director Lee Daniels are from Philadelphia. That’s considered north. They are not the first to translate southern cuisine (which became “soul food” in African American urban communities in the 1960s) or culture into racial stereotyping. I blame it on fast food. No one eats homemade chicken the way they eat it from the fast food chains. Who’s hands prepare it? The NBC moment came right on the heals of the Australian “KFC Cricket Survival Guide” commercial featuring a white man who makes friends with drum rocking black people when he pulls out a bucket of fried chicken pieces. This is how fast food corrupts. The first fried chickens were served at Sunday morning breakfast when the outside work was finished. It was leisurely enjoyed with hot biscuits and delicious browned gravy. Lewis was born in Freetown, Virginia in 1916, a farming community whose first residents were free persons after the Emancipation Proclamation was signed by Lincoln. Frying chicken was a time consuming task, as well as seasonal in Lewis’ Freetown. Lewis also migrated to the north where she was the chef at the Cafe Nicholson in Manhattan, frequented by southern writers Truman Capote and Tennessee Williams, and other writer and artists in search of real Southern food. You can watch Lewis in action in “Fried Chicken and Sweet Potato Pie” by Bailey Barash featuring Edna Lewis and Alabama chef Scott Peacock here. Alert – there’s a whole pig prepared for cooking in this film. Lewis spent her last years with Peacock who became her close friend and culinary collaborator. She died in 2006. I’m going to tell her that you and I sat on the bunk and ate, and you said how good the food was. I won’t tell her what you did. She is already sick, and that would kill her. So I’m going to lie. I’m going to tell her how much you liked the food. Especially the pralines. Ms. Calhoun reminds me of Miss Emma or even Grant’s Tante in A Lesson Before Dying. You can hear the hurt in her voice having her food rejected by “one of her own.” I remember my aunt who looked after me as a child, asked me to visit her when I got home from college. She made me fried chicken wings from Murrays in a stainless steel pot. Camille Akeju, director of the Smithsonian Anacostia Community Museum and former director of the Harlem School of the Arts, shared her stories about growing up and having fried chicken for Christmas or other special occasions with her family in Virginia during Eatonville Restaurant‘s Food and Folklore event on African American holiday celebrations and traditions. Part of the prix fixe meal included…you guessed it… “fried chicken.” I was also one of the panel judges to choose Eatonville’s chef. The entree for that competition was fried chicken. Then the men would stick their arms out with a flourish and ask their ladies: “You lak chicken? Well, then, take a wing. ” And the ladies would take the proffered “wings” and parade up to the long table and be served. Of course most of them had brought baskets in which were heaps of jointed and fried chicken, two or three kinds of pies, cakes, potato pone and chicken purlo. The hall would separate into happy groups about the baskets until time for more dancing. The NBC incident is probably about more than just food. The fact that it took Ms. Calhoun and her colleagues several years to have a Black History Month menu says something about the organization and perhaps deeper employee tensions that may have a tight lid on for now. Other than that, make me a plate with Ms. Calhoun’s fried chicken, black eyed peas and rice, collard greens with smoked turkey (the healthier alternative to ham hocks), cornbread, or any food made by loving hands. I think Ms. Calhoun is owed or at least deserving of some kind of appreciation for her effort, and an opportunity to tell the story of why she chose these foods. There’s no need to jump from the frying pan into the fire. Note: The Big Read DC will conduct a city read of A Lesson Before Dying in April/May. More information in a future post or update. Update: In all fairness, I’m posting this clip with Questlove (from Gawker.com) who says the twitpic he posted was intended to be a joke. I’m still confused as to where the joke lands. Was it supposed to be funny to feature a menu like this for Black History month (which is still a put down)? Or was the menu a fake (still a put down). But I’ll let the brotha have his say. He also treated Ms. Calhoun to a bouquet of flowers and a spa certificate. I’m glad Questlove and Ms. Calhoun are cool. But I still stand that there was nothing wrong, funny or ironic about the menu from the beginning. 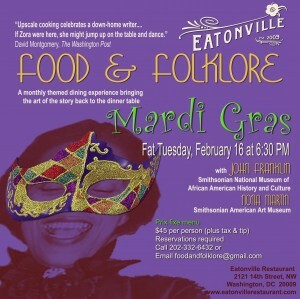 But I’m working Fat Tuesday on another Mardi Gras celebration at Eatonville Restaurant for Food and Folklore. I asked John Franklin from the National Museum of African American History and Culture, and a culinary griot in his own right (someone I just love to hear talk), to be our guide through the foods of the Americas that somehow found their way on the Mardi Gras supper table; that’s where Nona Martin takes over, a native of New Orleans and also a member of the Smithsonian team (like John) at the American Art Museum. She’s going to give the real deal about the Mardi Gras meal. And of course there will be food and Hurricanes to drink. Mardi Gras attire encouraged. How ’bout this graphic? That’s Zora Neale Hurston. She wears the mask.